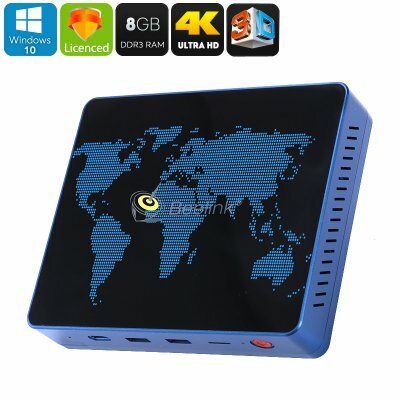 Successfully Added Beelink S1 Mini PC - Licensed Windows 10, Intel Apollo Lake CPU, 8GB DDR3 RAM, Intel HD Graphics 500, 4K Support, 3D Movie to your Shopping Cart. The Beelink S1 Mini PC is the perfect gizmo for those of you that often travel around or simply have limited space available at home or in the office. Thanks to its compact size, this Windows mini PC can be easily carried around anywhere you go. It comes with both HDMI and VGA ports. This means that you’ll be able to hook it up to virtually any external display. Once connected, it will turn your big screen into a full-blown personal Windows computer that is filled with your personal files. With this mini PC at your side, you’ll be able to turn any display into your private PC. Whether you’re at home, the office, or traveling abroad – from now on you’ll always have access to your files. This mini computer runs on a licensed Windows 10 operating system. Therefore, it treats you to all the familiar Windows and MS Office features. You’ll be able to write up files, make presentations, and browse the web. Thanks to its advanced Intel HD Graphics 500 GPU, it even lets you enjoy decent PC games. Along with its Quad-Core Apollo Lake N3450 CPU and 8GB DDR3 RAM, this mini PC treats you to a smooth performance no matter what you throw at it. It comes with 64GB internal storage that can be expanded externally via its 128GB SD card slot. Besides functioning as a mini PC, the Beelink S1 can furthermore be used as a TV box. This cool gizmo supports 4K media files as well as 3D movies. It truly lets you turn your living room into your own private cinema. When hooked up to your big screen TV, it lets you enjoy your favorite movies like never before. Films can be inserted either through its SD card slot or downloaded/streamed straight from the internet thanks to its Dual-Band WiFi support. With this Windows 10 mini PC at your side, you’ll never have to experience a moment of boredom again. The Beelink S1 Mini PC comes with a 12 months warranty, brought to you by the leader in electronic devices as well as wholesale windows mini computers..